Maxine Dalgliesh-Quinn spent hours trawling property websites before deciding they would get more for their money by looking a little further afield than Brighton and Hove, which is when she spotted this property in the pretty village of Steyning, ripe for renovation. Whether you're looking for inspiration for your own home renovation or simply want to get an idea of just what's possible, you're sure to love this gorgeous renovation and its stylish Asian influences. If you're looking for even more inspiration, browse more of our real home transformations. 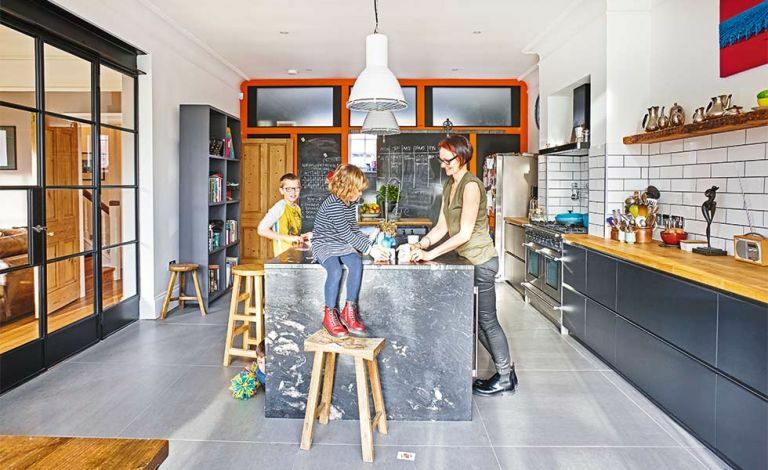 Read our guide on renovating a house, too, for more guidance. Having taken their time to find the right house, the couple decided they would live in the property for a year to decide how best to renovate and extend it to suit their needs. Work didn’t start until January 2015, by which time they had enlisted the help of architect Arch Angels, to help them create their dream home. The basement level is now accessed via a bespoke circular steel staircase from the extended kitchen-diner above. Also on the ground floor, opening from the living room adjoining the kitchen-diner, the couple built a veranda on stilts over the paved area at basement level. ‘The result is that you really do feel like you’re in the garden, even on a dull day,’ adds Maxine. The couple knocked the kitchen and dining room into one open-plan space and replaced the wall between it and the living room with Crittall-style doors. ‘We love the 1930s’ Shanghai feel, and the black doors really play into that,’ says Maxine. The project went relatively smoothly, needing no planning permission, as the work was covered by permitted development, though it did require the approval of building control. ‘We had one setback when too few kitchen floor tiles arrived and we had a six-week wait on the rest, only to find that once they were laid, the already fitted doors wouldn’t open and had to be removed and shaved down,’ Maxine says.